Deep within the Swiss Alps, tucked between Zermatt and St. Moritz, lies what is perhaps the most ambitious little town in Switzerland: Andermatt. With just 1,200 residents and limited access during the depths of winter, Andermatt appears to be at a disadvantage up against flashier ski resorts and yet, it’s home to one of the world’s most alluring alpine hotels, The Chedi Andermatt. Nathalie Breitschwerdt ventures into the valley to discover Andermatt’s hidden luxury. We travel to Andermatt by train. The tracks run alongside Lake Lucerne, winding up through the stunning Alpine foothills, bringing us down into the fairytale like village of snowy Andermatt and almost straight to the door of The Chedi. Visioned by the ‘starchitect’ Jean-Michel Gathy, The Chedi sits in the heart of the village at the base of the Gemsstock mountain. 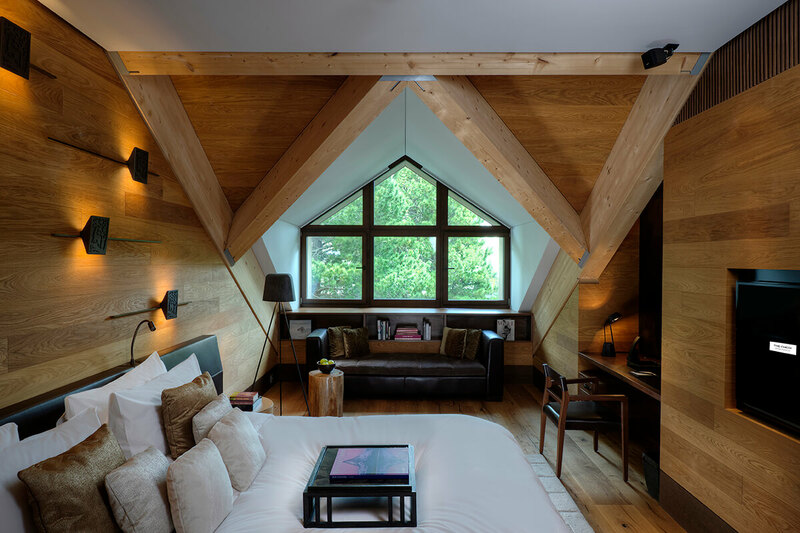 Although it stands tall with 123 spacious rooms and suites, the hotel’s dark-wooden facade blends in harmoniously with Andermatt’s traditional chalets, balancing grandeur with a cosy kind of warmth that’s especially inviting after a day on the slopes. Throughout the winter season, the hotel offers a private Ski Butler service to assist guests with mapping the best routes. We select a route of hidden trails, trying to cover as much as possible of the Andermatt-Gemsstock-Nätschen ski area (approximately 120km), and for much of the day, we’re skiing on deserted slopes, which makes a welcome change to the stilted swerving that the more crowded resorts like Verbier and St. Moritz require. We arrive back at the hotel with flushed faces to be handed cups of creamy hot chocolate, before making our way to the spa. Spread over two floors, the spa is a sensual, fragrant space with two large swimming pools (one that sits in the snow outside and is – thankfully – heated) surrounded by plush loungers. Waiters circulate, at intervals, with complimentary smoothies, candied fruits, and flavoured waters. There’s a hydrotherapy section too, designed to resemble a kind of Asian temple, with various heated baths, steam rooms and saunas. Everything about the hotel from the lobby to the restaurants to the rooms is spacious and indulgent, blending Swiss Alpine chic with Asian Zen. Our room is romantic, sumptuous and warm with dark woods, brown leather, furs, soft lighting and artfully placed Acqua Di Parma candles – and of course, there’s the view: startling white snow covered mountains that seem to have been rendered to postcard perfection. That night, we dine in the main restaurant on the ground floor that features four open plan kitchens, where you can watch the expert chefs prepare Swiss, European and Asian delights, and a striking five-metre high cheese cellar at the room’s centre, stocked with Switzerland’s finest. It’s a vibrant, interactive dining experience with all the frills and flourishes you’d expect, whilst still paying attention to the quality and taste (the melt-in-the-mouth dumplings were our highlight). For a slightly more casual affair, there’s also a little Swiss chalet set-up in the courtyard of the Chedi during the ski season, which re-creates the authentic alpine restaurant atmosphere complete with red and white checkered curtains and hearts carved into the wooden shutters. Inside, it’s compact, seating only five small groups and the speciality is cheese fondue, which comes a variety of ways – we choose a heady mix of champagne and truffle. 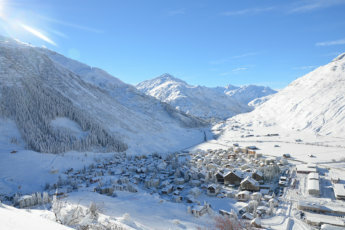 Historically, Andermatt’s residents have always had to face the challenge of survival with its harsh winters and steep valleys. However, it continues to blossom despite the elements, maintaining a unique kind of other-worldly charm and the allure of remote escape. Make plans to go sooner rather than later – it won’t be long before the rest of the luxury world catches on.